The great Polar Vortex of 2014 has captured the nation’s imagination. That doesn’t mean we can’t take a look at the state of the world’s greenhouse gas emissions. In fact, there is nothing dissonant at all about climate change and cold snaps. There is a ton of great data and material available on greenhouse gases and climate change, but one very useful resource for visualizing anthropogenic carbon emissions is the Global Carbon Project’s 2013 Global Carbon Budget. In some ways the information presented in the report is quite basic. But when looking at the latest climate models and their implications for extreme weather, or analysis of the predicted impacts of climate change a particular ecosystem or populated area, it’s easy to lose track of the simple truth of just how much carbon humans are releasing into the atmosphere. I think it’s worth taking a look at the entire Global Carbon Budget, but here are just a few graphs that I think are simple yet illustrative. Global CO2 emissions from fossil fuel burning and cement production, gigatons carbon per year. The plot above shows how much carbon is released each year from fossil fuel burning and cement production. So what does it tell us? Well, first of all the amount of carbon emissions is increasing every year. It’s important to note that even if carbon emissions stopped growing tomorrow, the amount of carbon in the atmosphere would continue increasing. This can be best understood by the bathtub analogy. Not only is the amount of emissions increasing every year (with the exception of the global financial crisis), but for most of the time period the rate of increase was increasing. This is not good. Finally, there’s a kink in the slope of the graph around 2002. What’s going on there? 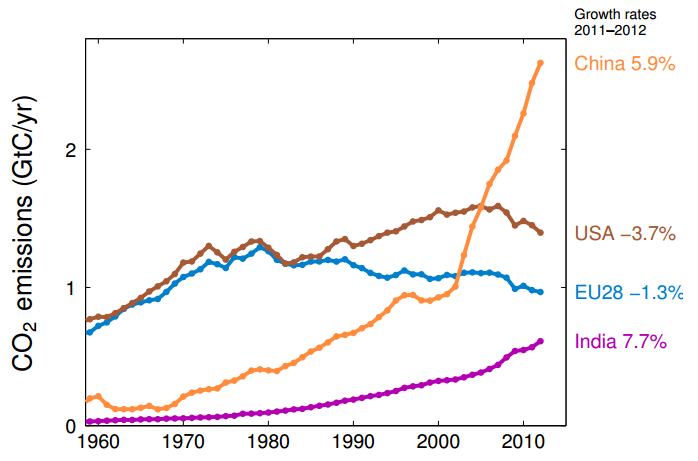 CO2 emissions from fossil fuel burning and cement production in selected countries, gigatons carbon per year. And here we have the answer. Starting in the early 2000s, China began a period of explosive economic growth and infrastructure development, and carbon emissions increased as a result. Much of the increase in Chinese carbon emissions is due to coal-fired power plants, but cement production and petroleum also played a part. Sometime around 2006 China surpassed the U.S. as the world’s largest carbon emitter (although on a per capita basis the U.S. still releases a much larger amount of greenhouse gases). From 2011-2012 Chinese carbon emissions grew almost 6%, while U.S. and European emissions actually decreased. 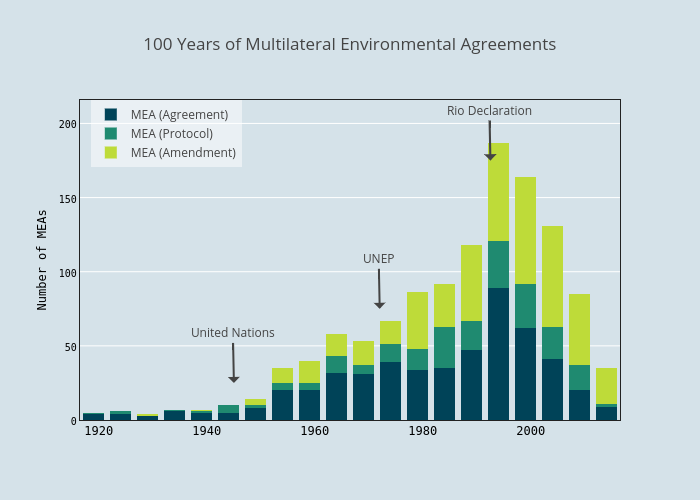 One common argument you will hear at international climate change negotiations is that rich countries, like the U.S. and EU nations, are responsible for the majority of historic cumulative carbon emissions and should therefore bear a larger share of the responsibility of mitigation of and adaptation to climate change. And while the premise of this argument – that a small set of rich countries is responsible for most of the carbon that has been emitted into the atmosphere – is true, it is changing. Take a look at the graph above. You can see that 140 years ago the majority of carbon from fossil fuel burning in the atmosphere was from Europe. That makes sense. The industrial revolution began there and Europe was still the most highly industrialized region on earth. By 1960, the U.S. was responsible for a bit more than 40% of the total historic anthropogenic carbon emitted to the atmosphere, and Europe about an equal amount. 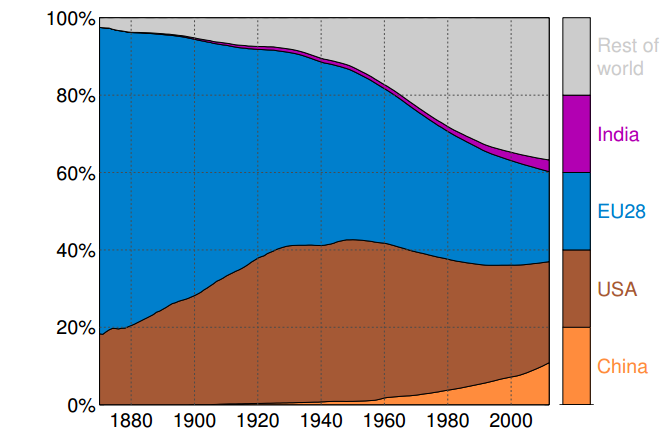 The rest of the world had contributed less than 20% of cumulative emissions. But today, the U.S. and Europe are responsible for 50% of cumulative emissions, and countries like China and India are rapidly increasing their cumulative total. So this argument may lose its appeal for some countries if current trends persist.